This tattoo image is believed to have been originally created by Dave at Eternal Tattoos Howell, MI located in Howell, MI on or around Jun 9, 2018. 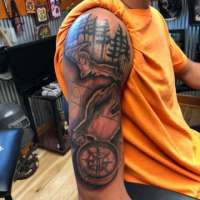 The image, image's subject and the tattoo artwork involved in the image shown above are property of Eternal Tattoos Howell, MI. Started this fun one today! Check me out on the Instagram thingy. @_davegee for more and to stay updated with my recent projects. Thanks y’all. Space will be added to this one in a couple weeks. Tattoo images by Dave from Eternal Tattoos Howell, MI. Tattoo images from Eternal Tattoos Howell, MI in Howell, MI. Tattoo Images near by in West Bloomfield Township, MI.